Today I had the great pleasure of being interviewed for the Virtual Parenting Conference on the How to Learn website by best-selling author and learning expert Pat Wyman. Pat and I have known each other since the early 2000s, and connected at our first meeting due to our shared love of learning and interest in teaching through sensory modalities. Considering our similar vision for education, it’s a pleasure nowadays to be working more closely with Pat. 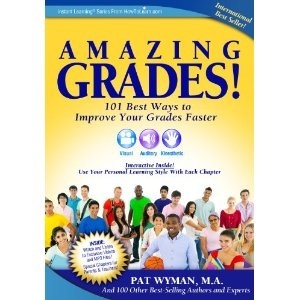 This summer, Paul and I contributed a chapter to Pat’s new multimodality book Amazing Grades: 101 Best Ways to Improve Your Grades Faster. My topic for the conference was “Five Brain Gym® Activities to Develop Reading and Visual Skills.” Pat asked me some great questions. We discussed visual skills as they relate to reading and attention, and did Brain Buttons, the Energy Yawn, and other Brain Gym activities together with listeners, noticing how these activities can support the abilities to focus and track with ease. I talked about some of the latest research that supports moving to learn, and shared some favorite quotes from education and neuroscience. Thank you, Pat, for an evocative hour of discussion! The mp3 of this and 13 other excellent presentations, along with various presenter gifts, are available at any time for those who register at http://tinyurl.com/9apxm2h. And you can download my other one-hour mp3 talk, “Invite Learning Readiness,” on this Hearts at Play site. (C) 2012 by Gail Dennison. All Rights Reserved.